Are you looking to buy a cheap laptop? Want to read reviews of budget laptops under £300? Whether you are on a strict budget, or simply want to buy a laptop for occasional use, and can’t justify paying more, then our guide to budget laptops can help you. This article provides reviews of the best £300 laptops, as well as a couple just over this budget threshold. Strictly speaking this laptop could be considered a netbook due to it’s smaller screen (11.6 inches rather than the standard 15.6 inches) – however it does boast an impressive specification for it’s price tag of around £280.00. The smaller screen should result in less power consumption, and thus longer battery life (approximately 4 hours under regular use) than one of it’s larger screen rival’s laptops. Powered by the AMD E450 1.65GHz processor, this laptop also boasts an impressive 4GB of DDR3 RAM, as well as a spacious 500GB Hard drive. The operating system is the solid Windows 7 Home Premium 64-bit, all wrapped up in a beautiful silver casing. All the standard laptop facilities, such as webcam, speaker, card reader, 3 USB ports, a VGA and HDMI port and a combined jack (mic and headphones) are included. Cons: Battery life although good for a laptop, is not that good compared to actual netbooks. Smaller screen at 11.6″. To conclude, this is an ideal student laptop, as well as those who travel regularly – the smaller size, lower weight, decent battery make this highly suitable for those who have long commutes or wish to buy a travel laptop. Buy the Samsung 305U 11.6 inch Laptop or read more reviews. Next up, the Lenovo G580 15.6 inch Laptop – a regular sized laptop, with a standard 15.6″ screen. Featuring the speedy Intel Celeron B820 1.7GHz processor, an impressive 6Gb of DDR3 RAM, Windows 7 Edition Home Premium operating system, as well as a huge 750Gb hard drive, DVDRW drive, built in Webcam, and an Integrated Intel Graphics card. This particular model can be found on sale in a blue casing for around the £299.00 mark – it may cost more in other colours – please bear this in mind. Pros: Larger screen, better specced than most rival manufacturer’s equivalent laptops, bargain price. 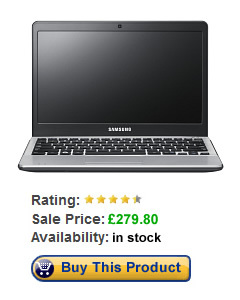 So why buy this laptop over the Samsung above? Larger screen, more Ram, bigger hard drive and faster processor. The downsides being that due to the increase in screen size, the battery life is probably less, and the increase in size and weight mean it is less suited to regular commutes. To conclude: a bargain 15.6″ laptop, with a high spec – an ideal starter laptop at a very reasonable price – great for students and first timers, as well as for regular household internet / e-mail use. Buy the Lenovo G580 15.6 inch Laptop or read more reviews. Acer have a reputation for building high specification laptops at very competitive prices – the Aspire 5250 is their £300 budget laptop. In a sleek black and charcoal grey finish, complete with an AMD E300 1.3GHz processor, a substantial 320 gigabyte hard drive, 4 gb of RAM, DVD drive, decent webcam and Windows 7 Home Premium 64-bit, this laptop contains a lot of bang for the buck. Pros: Nice finish, decent spec, reliable manufacturer, good price. Cons: Speakers, as with most laptops, aren’t great, so invest in some external speakers or decent headphones. 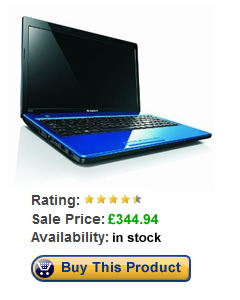 To conclude: A decent reliable laptop at a very reasonable price. However, if you don’t mind the blue casing, then the Lenovo G580 offers better spec for the money. 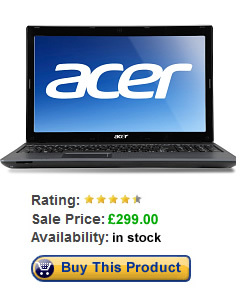 Buy the Acer Aspire 5250 Laptop or read more reviews.